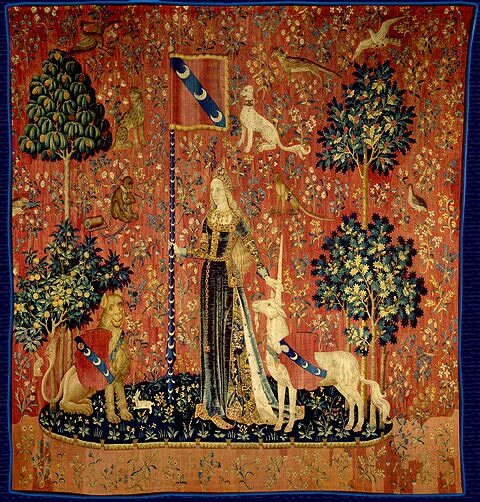 The Lady and the Unicorn, or La Dame à la licorne, is a collection of six highly allegorical tapestries, housed, since 1882, in the Cluny Museum in Paris. As noted above, they were commissioned in 1464 by Jean le Viste or Antoine Le Viste (see Antoine le Viste, Wikipedia [FR], a prominent lawyer attached to the court of King Charles VII. 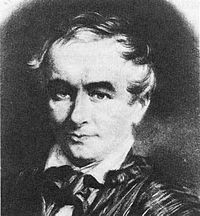 In 1475, at the age of 43, Le Viste married Geneviève de Nanterre thereby entering nobility. The six tapestries were made in the Netherlands, of wool and silk, but designed in Paris. The Unicorn is one of my four main mostly mythical both also mythological and zoomorphic animals. Zoomorphic animals combine the characteristics of several animals, or the characteristics of a human and an animal and are also anthropomorphic, humans in disguise. The other mostly mythical animals are the Dragon, the Phoenix and the Griffin. However, the Unicorn is perhaps the most famous and beloved among legendary beasts and it has been a source of inspiration to various authors, filmmakers and artists, one being J. K. Rowling of the Harry Potter series of novels and films. Children are particularly fond of the unicorn. But that is another story. For the time being, all I wish to say about the ubiquitous Unicorn is that, although he is a universal figure, there is a European legend according to which he cannot be caught by anyone other than a virgin. In Europe, the Unicorn symbolizes purity and, at times, Christ. In this respect, the Unicorn straddles paganism and Christianity as do feasts, most of which are seasonal. Christmas is celebrated on the shortest day, and the longest day is June 24th, St John the Baptist’s day. However, just how the tapestries forming The Lady and the Unicorn series are linked to the myth according to which birds (foules; fowles) mate on February 14th, St Valentine’s Day, is a bit of a mystery. But we do know, first, that Geoffrey Chaucer (1340 – 1400) told this myth in his Parlement of Foules, (Parliament of Birds, 1382). Second, we also know that Chaucer (from chausseur, shoemaker) had translated into English the French Roman de la Rose (The Romance of the Rose), the most important courtly, yet satirical, novel written in medieval France. Moreover, we cannot exclude an oral tradition that would link the Lady and the Unicorn and the myth about birds mating on St. Valentine’s Day. The oral tradition has its validity. But it could be that Chaucer may have situated the legend of the mating of birds on February 14th in the courtly love tradition epitomized by the Roman de la Rose and in which the “Lady and the Unicorn” could be inserted. Given that they share a romantic aspect and that both are products of medieval France, a similar thread, or fil conducteur, runs through La Dame à la licorne tapestries and the myth according to which birds mate on February 14th. The Middle Ages were the Golden Age of bestiaries, of which the best known is Richard de Fournival’s Bestiaire d’amour. It could be that a medieval Christian bestiary had to include a unicorn or some other who could only be caught by the ideal woman: a virgin and, as written above, symbolized purity, not to mention Christ. 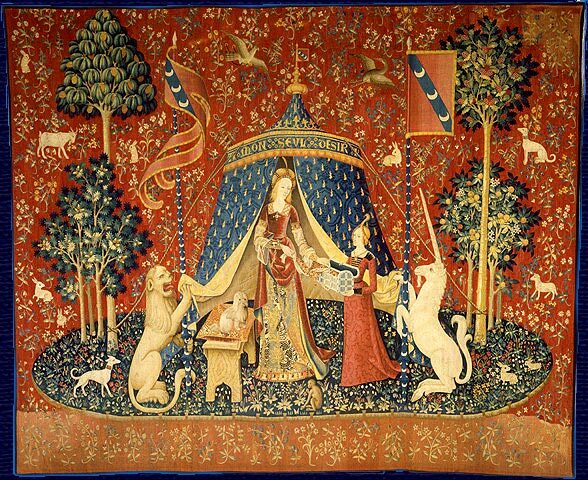 *In order to see better pictures of all six tapestries, please click on The Lady and the Unicorn. Also click on the above picture to enlarge it. However, because all six tapestries feature a lion, standing on the right side of the Lady, and the mythical/mythological Unicorn, standing to her left, holding pennants or crests, there could be other interpretations. For instance, the Lion, the king of animals, and the Unicorn are heraldic animals. Besides, as we know, there seems to be no end of medieval animal lore, the illuminated twelfth-century Aberdeen Bestiary constituting one of, and probably the finest, illuminated bestiaries. I should point out that the tapestries reflect the influence of the Crusades on Europeans. Crusaders discovered beautiful rugs often called “Turkish,” regardless of their precise origin. 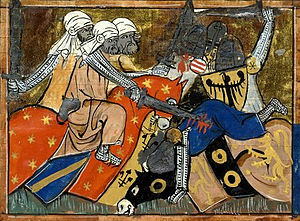 The Crusades helped shape the Western imagination to a degree that may be underestimated and/or understated, not to say ignored. With respect to motifs, yes the mille-fleurs motif is used in both The Lady and the Unicorn and The Hunt of the Unicorn, but “Turkish” rugs also featured animals, often very small animals: Minuta animala, birds: aves (our majestic Phœnix), and other animals. La Dame à la licorne tapestries are ornamented with both the mille-fleurs motif and depictions of animals. that they belong to a courtly tradition. Contrary to some notions, well explored articles still fetch in reviewers like me. You confirmed clear understanding of the subject issue and my tips are actually complete after reading publish. Make sure to preserve up the sound function and i’ll sign up to your rss nourish to become knowledgeable of any emerging postings. Good post. I learn one thing more difficult on totally different blogs everyday. It would all the time be stimulating to read content from different writers and follow a little one thing from their store. I’d choose to use some with the content on my blog whether you don’t mind. Natually I’ll offer you a hyperlink in your net blog. Thanks for sharing.